When the planet Archetryx is threatened by a Dalek assault squad, the Doctor and Evelyn become embroiled in an ever-deepening mystery. What has become of President Romana, missing for twenty years? What lurks in the vast gravity wells of Archetryx? What is the secret of the ancient element the Daleks are synthesising – and how does Gallifrey feature in the plans? Colin Baker as the Doctor in The Apocalypse Element. There is a lot going on in The Apocalypse Element. Big Finish crammed a whole bunch of story into 2 hours and 22 minutes, making this serial the longest I’ve reviewed so far. Russell T Davies has gone on record as saying that putting the Time War on the small screen would never happen, due to its sheer size and scope being both a budget and a writing impossibility. But we’ll always have this story; a grand, sweeping epic involving the Doctor’s long time foes the Daleks, action and destruction on a galactic scale, the return of one of the Doctor’s most cherished companions, and a climax involving something absolutely unthinkable; the Dalek invasion of Gallifrey. The summit on Archetryx involving the signing of a temporal treaty by the time-travelling civilizations of the galaxy is surrounded by the highest levels of security. So when the Doctor and Evelyn show up unexpectedly, it’s to no one’s surprise. The treaty is being signed regarding access to an asteroid that contains a newly discovered element, so rare that it’s only found on that asteroid. However, the asteroid is not on a set orbit – it appears and disappears randomly through the solar system. Its last sighting was twenty years ago, right before it vanished into the depths of space, taking everyone currently on the asteroid with it. An ‘everyone’ that includes the President of Gallifrey, Romana, who has been held captive on the asteroid for the past two decades by none other than the enemies of the known universe…the Daleks! 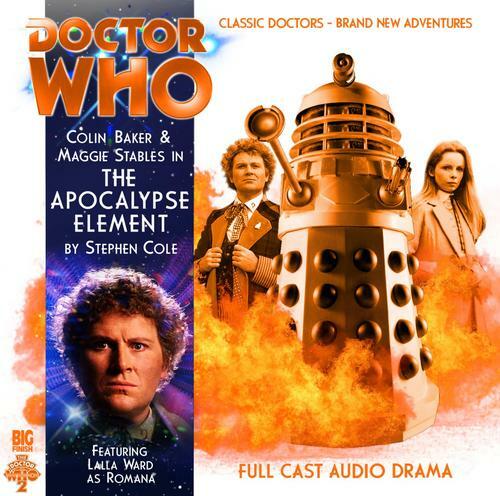 The Apocalypse Element is the second serial that Stephen Cole has written for Big Finish. He penned the Fifth Doctor serial The Land of the Dead, as well as being the author of over a dozen Doctor Who novels. Cole shows his experience with the franchise in this script, as well as showing improvement in working with the audio format after the glacier-paced Land. The first episode is a classic “something’s fishy here” tale, the second episode is a “base under siege” story, the third episode is one where everything goes completely to hell, and the fourth and final episode is one where you wonder just how the hell the Doctor’s going to get out of this one. While this ensures that The Apocalypse Element is never boring, it also means that a LOT of story is crammed into only four episodes. Indeed, a fifth or even sixth episode would have been ideal in order to fully flesh out all of the ideas contained within this serial, but that would have been TOO long a story, even for television and especially for audio. Once again, the editor’s scalpel could have been used to carve off a bit of the story’s meat, leaving behind a leaner but more compact story that still had the same impact. It’s not that the story is padded, it’s that there’s just too much going on; we get a story that’s frantic, a little bit confusing, and loud. I mean “did Rick Rubin produce this” LOUD. The sound department at Big Finish cranked it up to 11 for this story, and not in the best way. The dialogue is fine, but the special effects are at a much higher level. When you have Dalek weapons, explosions, the sounds of combat, and mind control devices, and all of them happening at the same time, it can play merry hell on the listener’s ears. I was saved b the fact that I listened to this audio in my car during a long road trip with the windows down, and even then it still seemed a bit loud to me. I had to turn it up to hear the dialogue and turn it down to endure the noise. I shudder to think what would have happened if I had earbuds in. The script manages to nail the “big three” of The Apocalypse Element. Let’s start with the Daleks. The Daleks in the previous serial, The Genocide Machine, were a small strike tream, and a handful of them managed to single-handedly take over the largest library. This time out, it’s an entire Dalek assault fleet, playing an incredibly large game that involves direct assault, a Trojan Horse, brinkmanship, and sacrifice. In short, it’s the type of plan that the Daleks usually utilize; overblown, yet somehow dangerously close to succeeding. The Daleks here are relentless. Nothing is safe from their assault. Those who survive only do so because the Daleks have a use for them. When they finally launch their assault on Gallifrey, the sheer panic in the voices of the Time Lords tell the listener all they need to know. The Daleks on Gallifrey was forever unthinkable. No matter what steps the Time Lords take, the Daleks find a way through; there’s a great scene where muffled explosions are evident in the background, as the Daleks self-destruct their power cores one at a time in an effort to blow their way through a heavy door. There’s also another scene where the retinal codes for the security doors on Gallifrey are overcome in a method that is pure Dalek and very disturbing to the listener. Stephen Cole gets the Daleks right; they’re terrifying, they’re unstoppable, and above all, they will succeed no matter what the cost. Having departed the TARDIS at the end of Warrior’s Gate, Lalla Ward makes her return to the role of Romanadvoratrelundar, or Romana for short (thankfully!). When we first meet Romana, it’s her twentieth year as Unit 117 prisoner of the Daleks. But this is Romana, Lady President of the High Council of Galifrey, and through a powerful soliloquy, we learn that she’s still the same Romana; unbowed, unbroken, unconquered. Every television companion Big Finish has introduced up to this point has sounded like they stepped right back into the TARDIS without missing a beat, but Romana is a bit different, as this story is set well after she left the TARDIS. A lot has happened off screen for the Time Lord. When we last saw her, it was at the end of “The Tom Baker Comedy Show.” The Doctor would say something funny, she’d roll her eyes, and the story would move along. In the time between Warrior’s Gate and The Apocalypse Element, she’s returned from E-Space, become High President, and has spent twenty years as a prisoner. But Lalla Ward still brings a strong performance; she might have been beaten down and worn out by the Daleks, but that spark of fire and the arrogant anger is still there. It might be a different Doctor than she was used to, but when Ward and Baker meet up, the chemistry is nearly instant. Two brilliant beings who bicker and snipe at each other due to impatience , but remain the best of friends and trust each other with their lives. This Romana has steel in her spine and will do what it takes to defeat the Daleks. Colin Baker. Well, he’s been great so far in his Big Finish run, always a high point of the story. Imagine him giving the speech below to Evelyn, trying to explain just how evil the Daleks are and how grand in scope their plan is. Yeah, he’s amazing in this one. Where Sylvester McCoy sounded a bit bored with the Daleks in The Genocide Machine, Baker gets across from the very beginning just how screwed the universe is with the Daleks running around. He’s passionate, he’s impatient, and he’s, best of all, scared. This serial was written solely with the Sixth Doctor in mind, it seems, and Baker pulls it off in spades. Sadly, the script isn’t as kind to Maggie Stables. Where the Doctor is freaked out at the Daleks, Evelyn is more…bemused. In the face of imminent danger, she attempts to be funny. Not gallows humor funny, but witty funny, and it just comes off completely and utterly wrong, like she’s going to offer the Daleks a piece of chocolate cake. Even as she plays an important role in the climax of the story, Evelyn just doesn’t come off as worried or scared. In this case, I blame the script, not the actress, as Maggie Stables played the part well, but what the script gave her just didn’t work with the rest of the story, especially coming off of a story like The Spectre of Lanyon Moor. Final Synopsis – A script too far, The Apocalypse Element needs a bit of trimming and a rewrite for Evelyn Smythe. The day is saved, however, as Colin Baker, the returning Lalla Ward, and the Daleks do their parts in this action-packed story. 3/5. Next up – In the 22nd century, the Daleks have occupied planet Earth. By the 43rd century, only a handful of humans survive. Still further into the distant future, a Thal scientist must choose whether to betray his heritage, or see the universe destroyed. Peter Davison is the Doctor in The Mutant Phase. 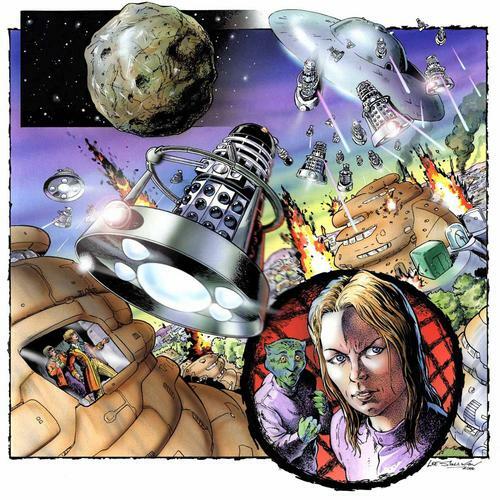 This entry was posted in Big Finish Review and tagged Big Finish, Colin Baker, Daleks, Doctor Who, Evelyn Smythe, Lalla Ward, Romana, Sixth Doctor, TARDIS. Bookmark the permalink.